Mounted Posters is rated 2.5 out of 5 by 2. Rated 4 out of 5 by SeaGlassVal from Pretty good product I tried this product after many years of posters mounted on foam core. The colors/surface of this product were a little dull but the detail was sharp. Because of windy conditions one of the posters dropped to the ground in my booth and entirely shattered the corner - it is quite brittle. Overall, a good product, and it is nice that I could print both sides for the same price. Rated 1 out of 5 by Jfoster from Everything is in inches I thought I was buying a 6’x4’ sign and instead I received a 6”x4” sign. Mounted poster printing offers many possibilities for small businesses. Custom mounted posters can vastly simplify artwork reproduction for homes and offices. They are also a handy option when you need something more durable than a standard poster for long-term promotions. 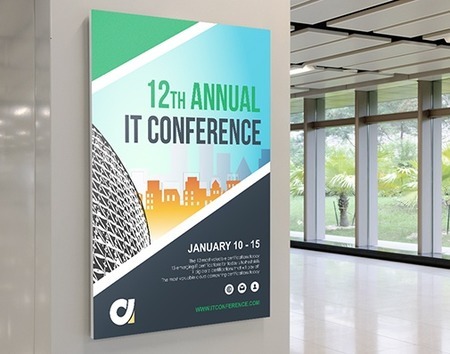 Custom mounted posters can easily be attached to many common wall surfaces. Unlike cardstock or paper posters, mounted posters require no framing or additional protection. Need help with custom poster printing? Fill out our custom order form or give us a call. Use our mounted poster layout templates so your business mounted poster artwork and designs are sized and formatted perfectly for your home or office space. PrintPlace.com layout templates can be downloaded for each standard size below, in a variety of popular formats. Mounted posters are an equally useful format for both marketers and anyone who wants to easily decorate a home or office space. They can be used as a minimalist frame-free alternative to traditional posters. You may use mounted posters anywhere you might use regular card or paper stock posters, except you no longer need to worry about protecting or framing them. They are a good choice for art reproduction at a short notice for spaces such as cafes, restaurants, and even art galleries. Personalized mounted posters are also a good choice for home and office decor, as they offer none of the hassles of traditional framing while offering a clean, modern look at the same time. Marketers who want to use mounted posters for advertisements and other promotions will also find that the ability to print on two sides makes these large format prints more versatile compared to other mediums.